When I was growing up, my Dad didn’t do a lot of cooking. And when he did cook, he tended to burn things. I can remember a few rather mournful weekends sitting at the kitchen booth in the house I grew up in on Fernandez Drive, while my mother was away on a Catholic retreat, trying to choke down blackened toast. It must have been breakfast. Or maybe it was burned fish sticks for dinner. Or maybe both. My poor Dad even tended toward burning things on the barbecue. But there were two preparations he excelled at, no matter what. Pancakes and popcorn. Pancakes were more of a special Saturday morning occasion, or vacation mornings, when he had time to wait at the griddle (to be honest he burned these a little too, but nobody seemed to mind). I remember one summer morning up at our neighbor’s cabin at Lake Tahoe when one of my aunts attempted to cook the pancakes out on the porch in our electric frying pan. She had a terrible time getting them to flip properly, and my Dad laughingly said it was because she couldn’t wait for them to be ready to flip, and instead kept “irritating the pancakes.” The directive not to “irritate the pancakes” became a family joke we never got tired of. Like pancakes, popcorn was usually a Saturday event. Sometimes Friday night. Whatever night something like Hootenanny used to be on was the night my Dad would make us all popcorn. Of course it was the kind fried in oil in a large pan, with a little butter melted to go over it in a very small pan. And of course lots of salt. Since my Mom had individual wooden salad bowls, we each got our own little “bowl” of popcorn. It was quite a treat. As I got older and began babysitting, popcorn followed me into those weekend evenings. I remember one night striking 19 matches before I successfully lit a gas stove burner (we had electric at our house) in order to pop Jiffypop (which my Mom always refused to buy) for three little tykes eagerly waiting and cheering me on. Of course in the 80’s there came air popped corn and microwaved popcorn–and still, today, in the low fat plant-based world, air-popped corn is considered a healthy treat. So why, oh why, am I not celebrating the so-called real thing here in this blog post? Well, to wax philosophical, as is my want, I AM celebrating the real thing. It’s just that over the years, it’s come to my attention that eating a big bowl of air popped corn hurts my teeth. And those of you who follow me know how committed I am to my own idiosyncratic happy tooth plan. That means only a handful of popped corn here and there. But, luckily for me, I believe the nature of reality is metaphorical. The whole universe is one big complex poem where equivalences are made between things that are seemingly separate and distinct. 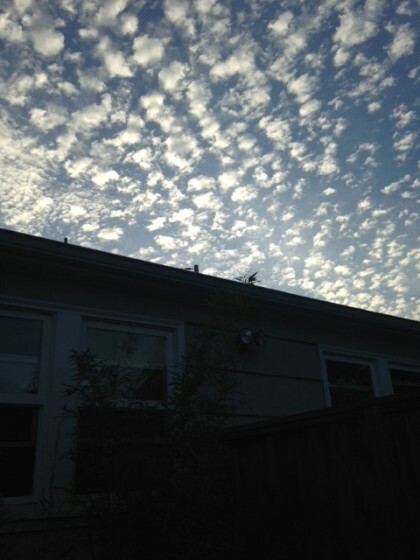 In addition to that paradox, all things shaped popcorn make me very happy–like these popcorn clouds I watched above my patio a couple of weeks ago, grateful for the passing of a heat wave. And boy, as far as I’m concerned, was she ever right. Now I know there’s other amazing treatments for cauliflower out there–you can do just about anything to it, and I’ve happily marched in that parade to the tune of cauliflower steaks, cauliflower tacos, alfredo sauce made from cauliflower, cauliflower wings, and more. It’s all good. 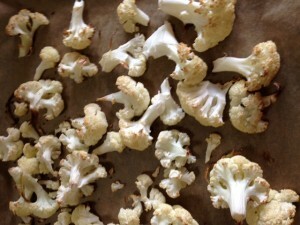 My new year’s resolution was a simple gastronomic one: to eat more cauliflower. Just because. Partly I like to poke fun at making resolutions, but partly I wanted to give myself permission to eat more cauliflower and not cheap-skate myself out of buying it when I’d really like some, even if it’s expensive. I’ve read that one of the many nutrients cauliflower boasts is vitamin K, and that’s good for people like me with slow moving platelets, as Dr. Swank has written about in The Multiple Sclerosis Diet Book. At least I figure it can’t hurt. When I made this resolution I was enjoying Kelly’s version of a Fork’s Over Knives cookbook recipe of cauliflower wings. I did make those a few times, and enjoy every bite. And years ago I used to make a cauliflower mash with millet and cauliflower that I laughingly called my “cauliflower baby food.” But it wasn’t long before I returned to this simple, elegant treatment. And now, almost every time I buy a head of cauliflower, no matter what lovely recipe I’ve recently seen and think I might like to try, I always end up breaking it into florets, tossing it with a smidge of salt and baking it at 400 for about 20 minutes. That’s pretty much cauliflower heaven for me. Of course you can roast cauliflower without the touch of salt, but for me this little bit makes the sweetness and natural flavor of this vegetable pop, and become almost extraordinary. I often add these to a bowl I’m constructing for lunch or dinner, but I always end up popping them into my mouth, too, hot, right out of the oven. Like popcorn. The shape of the florets and their snackable nature once roasted made me see the equal sign. Also the fact that I have been known to eat a whole bowl of this, like I used to do with popcorn, reinforced this playful equation. An added bonus for me is it doesn’t get stuck on my teeth or make them ache, and I feel much better being full from cauliflower than I do being full from popcorn. But that’s just me. You can have your popcorn AND you can have this cauliflower. You don’t have to choose. Either way, you’ve got a tasty bowl of toasty white clouds to sit back with and much while you watch “the show,” whether it is a beautiful sky or that movie you’ve seen 20 times but still love. I’m hard pressed to call this a recipe; nevertheless, here it is. Preheat oven to 400 while you break up the cauliflower in a salad bowl. Sprinkle with the salt and toss. Spread the florets on a cookie sheet lined with parchment paper. Bake in the oven for 20 minutes. Put back in the salad bowl and enjoy, or add to a favorite bowl or veggies, beans and starch. You can also dip them in your favorite sauce, but honestly, they don’t need a thing but their wonderful popcorn-posing selves. They are also good cold, if you can keep them around that long. You’re welcome, Peggy! It makes me so happy to know you relish each and every post! I REALLY enjoyed your radio show–the interview was great, and I laughed out loud each time I heard the song. Also wonderful you are having such vegan super stars in the Sacramento area. I was born there. Thanks for thinking of me, and sure, let’s talk about a possible interview. It is so nice of you to consider that. I am so blessed to have wonderful readers like you. And at least your dad mastered popcorn and pancakes! I love my dad, but I don’t think I’ve ever seen him turn on a stove. When Dad was “cooking” lunch, it was PB&J and carrot sticks, lol! Also–embarrassing given that my blog is Veggie Quest–I’ve never roasted cauliflower. (I know, right?) Anyhow, I printed out your recipe (has ingredients and steps; totally counts!) and I’m going to make it tonight with a head of cauliflower that’s been languishing in the back of my fridge without a purpose. Will let you know how it goes! I love this! While I enjoy baked cauliflower that is heavily salted, I also sometimes take it easy with the salt because I agree that it allows the slight sweetness of the cauliflower to shine. And yes, it’s fine to do all sorts of really fancy stuff with cauliflower, but sometimes the best preparations are the simplest ones, and this recipe is certainly proof of that. More importantly, I’m struck by your note about the metaphorical nature of things, especially as it relates to food. For me, part of the vegan journey has meant surrendering a very literal idea of what a particular food or dish is, and instead embracing an interpretation that hinges on texture, taste, or overall effect. I can think of so many foods — banana “ice cream,” tofu “feta,” and my own cauliflower huevos rancheros — that fit the bill. In many ways, thinking about food metaphorically often leads me to an interpretation that is (I think) more close to the original than one of the store-bought versions–which are ostensibly close replicas–would be (even though I like to buy those, too). Are you available on Wednesday, August 24th to be on my vegan radio show on KVMR? As you may recall, the subject would be how your diet ameliorated some of you m.s. symptoms, and other pertinent plant based subjects! It’s during the noon hour California time.